Most existing books in the fields of multicultural or intercultural education have been written based on anthropologists’ cultural dimensions, which presume culture is a fixed entity. 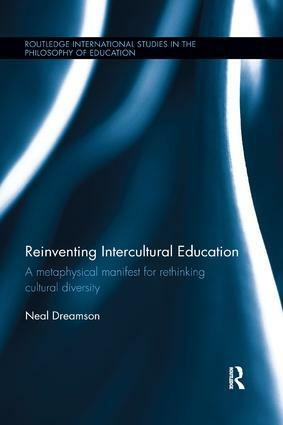 Reinventing Intercultural Education is the first book to review multiple cultures and religions from a metaphysical understanding. It argues that intercultural value interactions can be managed and taught in a way that facilitates individuals to reveal how they are metaphysically positioned within intercultural value networks. This book proposes a metaphysical understanding of interculturality, by reviewing popular cultural and religious narratives found in multicultural society. By doing so, it develops an alternative pedagogy for multicultural education founded on the concept of intercultural hermeneutics. Beginning with a critical review of multicultural policies and existing models of multicultural education, Dreamson advocates the necessity of an intercultural approach to multicultural education. He then moves on to argue for the methodological aspects of interculturality by reviewing and adopting philosophical hermeneutics theories. Throughout the book, it is argued that values incarnated as a cultural framework are networked and interact via our minds to sustain our intercultural realities. Furthermore, when intercultural interactions transpire, which is the goal of multicultural education, we can see a larger part of the world that, in turn, helps us cultivate ourselves for further intercultural interactions. The book should be of great interest to academics, researchers and postgraduate students engaged in the study of multicultural education, the philosophy of education, religious pluralism, religious education, cultural studies, theology and indigenous education. Neal Dreamson is a senior lecturer in the School of Curriculum, Faculty of Education, Queensland University of Technology, Australia. Through his interdisciplinary research and engagement in cultural/religious studies, indigenous education, philosophy, design and technology education, and ICT in education, he has articulated trans-cultural/-disciplinary methodologies to multi-cultural/-religious interactions and technological integration. Recently, he has extensively researched in metaphysical aspects of cross-cultures/-religions and the digital divide in Learning Management Systems, and developed philosophical understandings of and pedagogical approaches to value interactions.